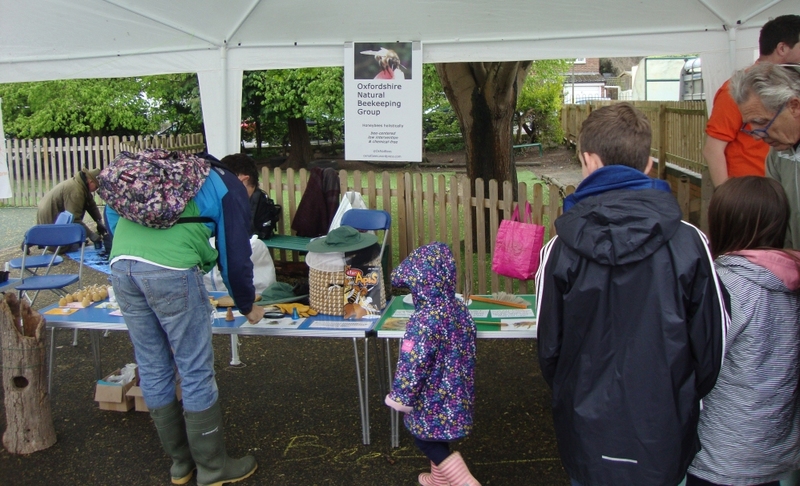 Jack, Jane and Phil set up our stall at Wolvercote Primary School‘s Festival of Nature on Saturday. We were between the Oxfordshire Mammals Group who were identifying skulls and footprints of deer, rabbits and badgers, and Oxford City Farm who kept kids busy throwing balls into a cutout pig’s mouth. 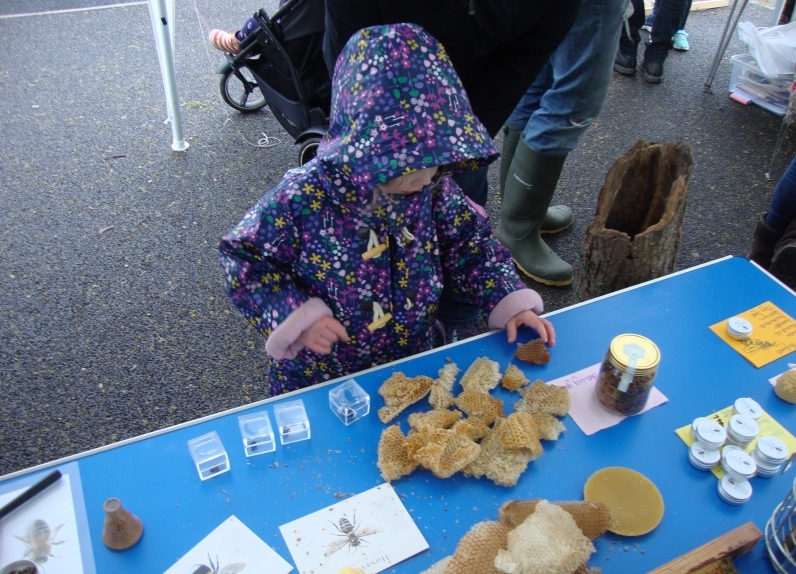 We talked to children and their parents about all aspects of bees and beekeeping. We had little clear magnifying boxes for them to identify a honey bee, a carder bee, a garden bumblebee and a wasp. Children looked through eye-prism kaleidoscopes to get a sense of how bees perceive the world; they scrunched up comb; felt smooth lumps of wax; saw how candles are made; looked into an (unoccupied) hive; saw how honey is stored in comb and tried on beekeeping gloves and veils. Despite the rain, the visitors to the stall were all enthusiastic and interested, and we were kept well-stocked with warm tea and coffee by the event’s organisers. We were pleased to have the opportunity to share our enthusiasm with so many people, and are hoping that we might see one or two of our visitors at future meetings. Related story: ONBG visited Wolvercote School in Autumn 2017. 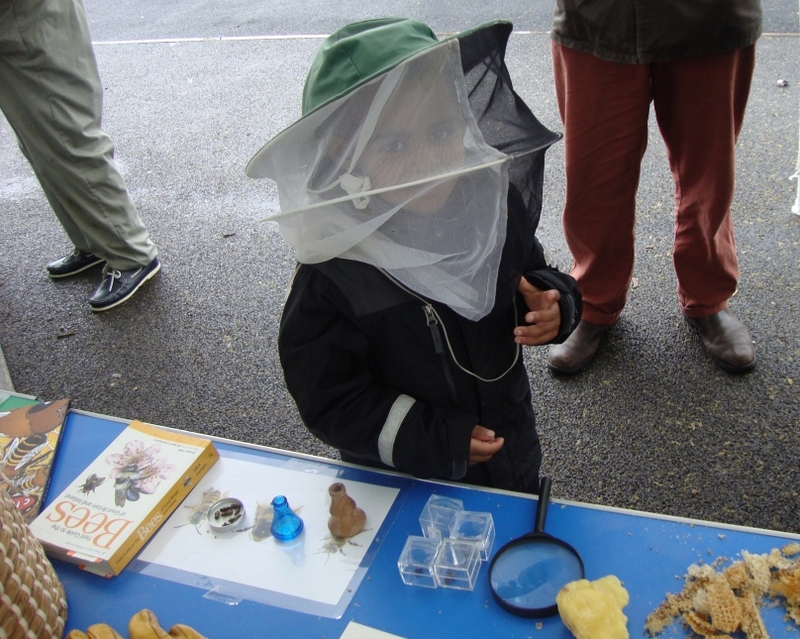 This entry was posted in Event, ONBG and tagged Children, kids, Naturefest, public engagement, public event, School, Wolvercote. Bookmark the permalink.